Oats are hands down my favourite way to start the morning! I love them hot or cold like my overnight oats, a steaming bowl of porridge or my homemade granola served with fresh fruit and yoghurt. Beetroot is one of my favourite vegetables so I wondered what would happen if I put the two together?? Could they be a match made in food heaven? The answer is of course yes!! 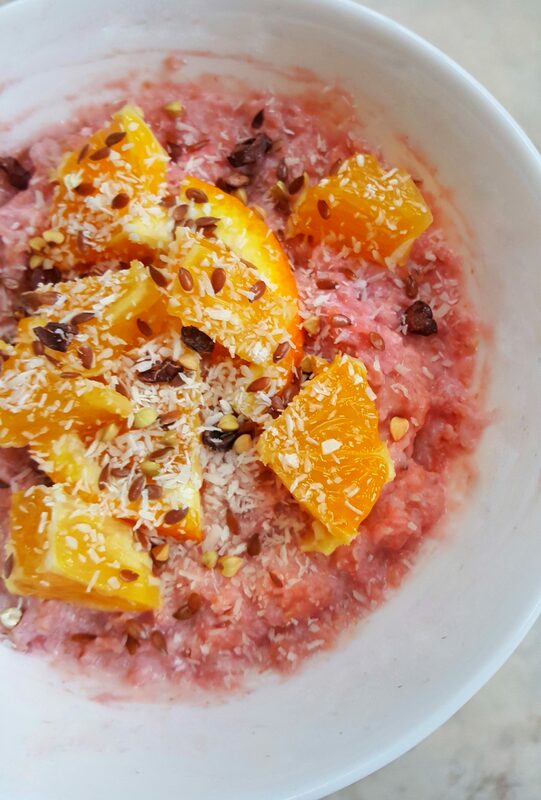 This porridge recipe combo happened by chance as most of my recipes do! Beetroot is always on my shopping list and I even like to make cakes using it – find the recipe for my Dark Chocolate Beetroot Cake in my cookbook. I use beetroot juice to make the cake icing naturally turn pink and had some leftover juice. I love adding fruit juice to my overnight oats so thought this could be a great way to add some colour and goodness to my morning oats. Beetroot can have an earthy taste. Combining the beetroot juice with natural sweetness of coconut and some creamy yoghurt make a very delicious flavour. Place all the ingredients in a bowl or saucepan and stir together. If you are planning ahead, allow the oats to soak overnight. To cook: microwave on high for 3 minutes or bring to a boil over a medium heat, turn down to a simmer and continue to stir until the desired consistency is formed. Enjoy with some fresh orange segments.